Remember that time I made a last ditch effort for Delta Skymiles? Well I'm kind of doing the same thing for AAdvantage miles right now. I've got a couple of different redemptions options in mind, but it's too early to tell exactly how I'll use them. 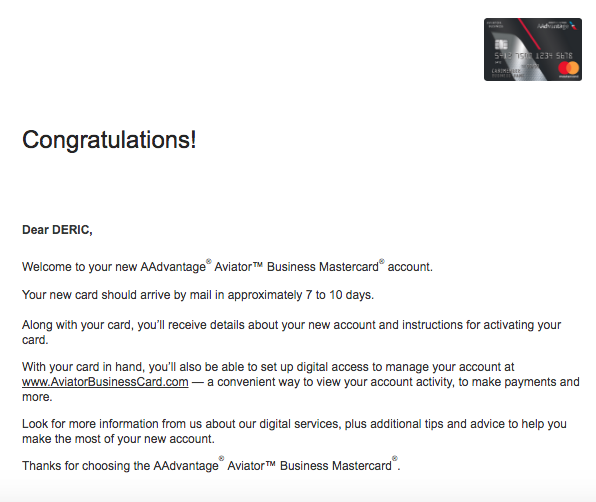 Last month I was finally approved for the increased sign-up bonus on the CitiBusiness/AAdvantage Platinum Select World Mastercard and this week I applied for the AAdvantage Aviator Business Mastercard. My application wasn't instantly approved, but I got an e-mail the next day confirming my acceptance. Between these two credit cards I'll have accumulated just over 120,000 AAdvantage miles. If I purchased those miles outright it would've cost me over $2,500! Not too shabby for just a couple months of credit card spend. What do you think I should do with my AAdvantage miles?